Mr. Pennington is Of Counsel with Coker Law. He has been a Civil Trial Lawyer for more than thirty years and has an established history of success in civil jury trials and appeals. He has served as trial counsel in litigation throughout the country in both state and federal courts, where he has represented both plaintiffs and defendants in a wide variety of cases. Mr. Pennington specializes in all areas of civil litigation, including pharmaceutical products liability, commercial disputes, intellectual property and trade secrets, environmental litigation, insurance disputes, personal injury, wrongful death and medical malpractice. He has for many years held an "AV" rating according to the Martindale-Hubbell legal rating service. He does not engage in any type of television or radio advertising. 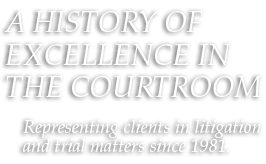 Most of Mr. Pennington's clients are referred by other attorneys, judges, physicians or former clients. Mr. Pennington has been recognized by a number of organizations for his excellence as a trial lawyer, including the American College of Trial Lawyers, the International Academy of Trial Lawyers, the International Society of Barristers and the American Board of Trial Advocates (ABOTA). He takes pride in giving detailed, individualized attention to each case. ©2006-2019 Carl Rufus Pennington, III, Civil Trials, Administrative Hearings, Arbitrations and Appeals, All Rights Reserved.